Cue the donuts & confetti! I can hardly believe it’s been one year since I’ve taken the leap and officially started this business. I am so excited to have made it to this milestone – because, let’s be real, not all entrepreneurs make it this far. 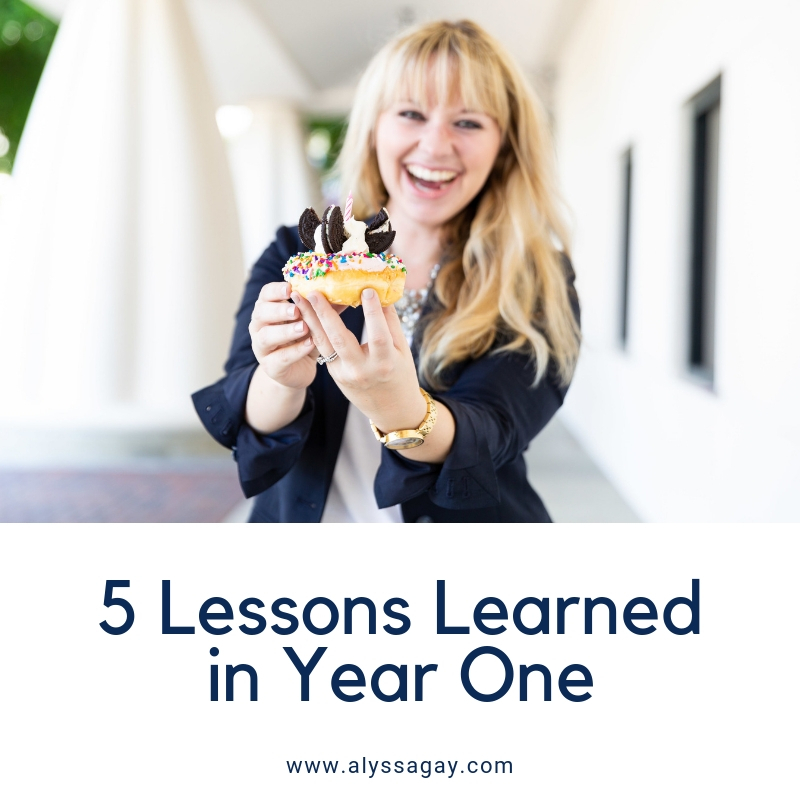 To celebrate, I thought I’d share (with some help from GIFs) five lessons I’ve learned in year one. This may sound simple, but I’ve seen so many entrepreneurs forget this or not keep up with this. One of the best things I’ve done was implement systems and processes that I know will save me time and frustration in the long run. Some examples include: a calendar, an email system, bank accounts, accounting software, and more. Many of the programs that I use either cost very little or are free (You can read about some of the free tools that I use here!) All the technical stuff isn’t fun, but I promise you it’s worth it to set this all up in the beginning. I’ll let you in on a little secret – you don’t know it all and neither do I! But, there are professionals for that. I’ve been able to surround myself with a variety of professionals to support me in this venture. That may look like a lawyer, accountant, or business coach. It may also look like a nutritionist, personal trainer, or therapist. You should also include a team of friends and family who are in your corner, cheering you on. You have to remember to take care of yourself – not just the business. It’s like as soon as you tell people that you own a business, they suddenly think that you have all the time in the world. Well, at least that’s what I’ve experienced. Here’s another little secret that no one wants you to know: it’s okay to say no. Practice it with me now: no. N.O. no. Doesn’t that feel good? This also applies to clients. You can’t be everything and do everything for everyone (this is a lesson I’m still learning). Don’t stretch yourself so thin that it creates more stress, headaches, and anxiety in the long run. I promise you that once you begin to set boundaries, you’ll feel a load come off of your chest. It’s not all PJs and freedom. This ties in pretty closely with lesson three. Don’t get me wrong, there are days where I stay in my pajamas and work. There are days that I am able to take off that I otherwise wouldn’t because of the flexibility of being my own boss. But, even though I’m the “boss,” I have clients that I answer to. While I’m able to take weekend trips or take time off, you’re never really “off” as a business owner. The emails and phone calls still come in, the bills are still due, and you still have to maintain not only your business, but all that you’re doing for your clients, too. This is something that I didn’t really expect and may be the hardest lesson I’ve learned this year (another one I’m still learning). There are days where I feel like our friend Milhouse 👆🏼. I’ve worked in offices with many people and now? Now, it’s me. No one is there to see all of the hard work that you do. No one is there to give you a pat on the back or an encouraging word when you need it. In my line of work, I’ll admit that not a lot of people fully understand what I do – which makes it even harder and lonelier. Most people in your life will not acknowledge your work and you’ll even feel like you’re letting people down (see #3 above) – but you have to do what’s best for you. You’re never fully prepared for all that happens with owning a business. In the first year, there have been ups and downs. Celebrations and failures. All you can do is wake up every day and do your best. Then, do that again. And again. And again.